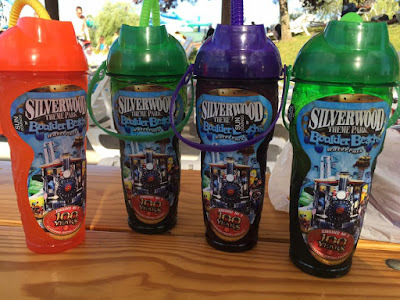 Silverwood Theme Park Review by Bridget Axtell | Silverwood Theme Park & Boulder Beach Water Park - Summer Fun! 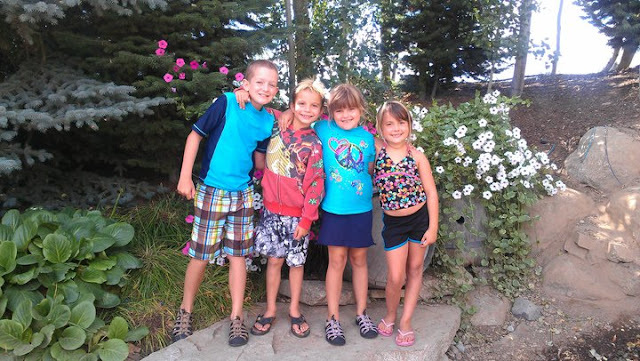 Silverwood Theme Park & Boulder Beach Water Park - Summer Fun! Summer is finally here! That means having fun, spending time outdoors, and creating family memories that will last a lifetime. 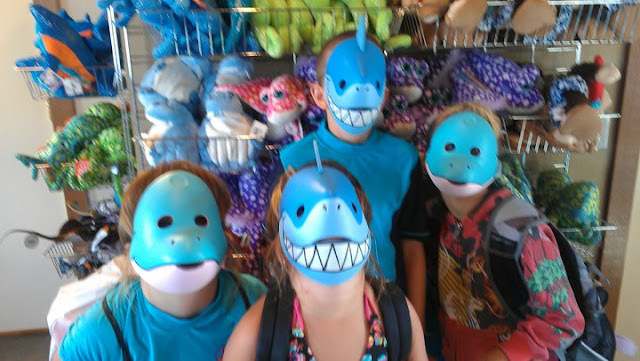 One of our family's favorite summer activities is going to Silverwood Theme Park and Boulder Beach Water Park. 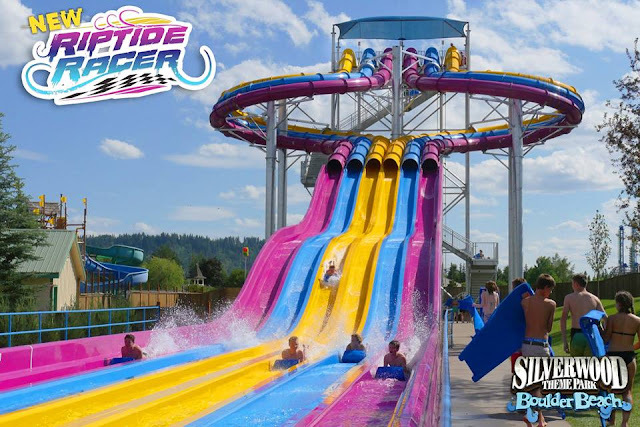 Located in beautiful North Idaho, Silverwood Theme Park is the Pacific Northwest's largest theme park, with over 70 rides, slides, shows and attractions, including four roller coasters, Boulder Beach Water Park, a steam engine train ride through the woods, live entertainment, magic shows, restaurants, and so much more. NEW this year is theRiptide Racer water slide! It is six bright, colorful water slides side-by-side so that you can race your family and friends to the bottom! This 6 lane water slide will bring out the competition as sliders race down the 400 foot slide at speeds nearly 30 mph! We haven't tried it yet - but it looks like a blast! The great thing about having a theme park and a water park at the same location... Silverwood Theme Park + Boulder Beach Water Park = one admission price = both parks! We get season passes to Silverwood every year, have for the past 11 years. We only live about 15 minutes away, so it is the perfect summer time activity for our family. We go for a few hours, have a blast and then come home. The carousel is just inside the main gate at the entrance of the park. From the time our kids were little (1 1/2 years old), they knew that this ride was our very last stop in the park before heading home. It made it easy to leave the park this way - no fits! 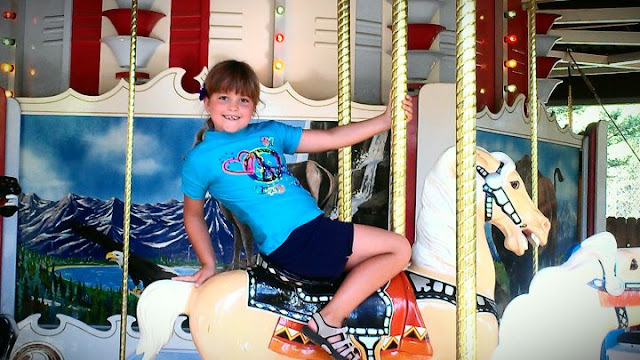 Now at ages 15 and 12, we still ride the carousel once or twice before heading home - it's a tradition! 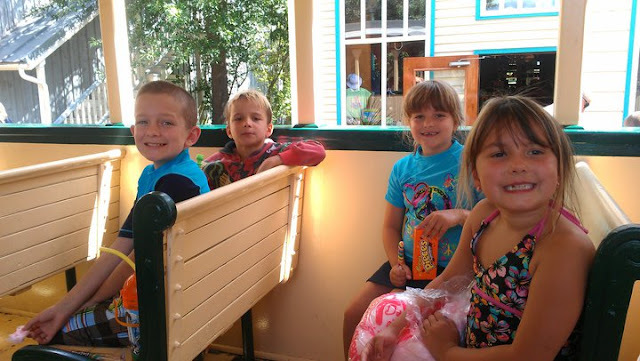 Of course we love the rides and water slides, but we also love the variety of other fun activities like the magic show, train robbery on the steam engine ride, seeing the bison, and the adorable and friendly mascots; Garfield and Odie! 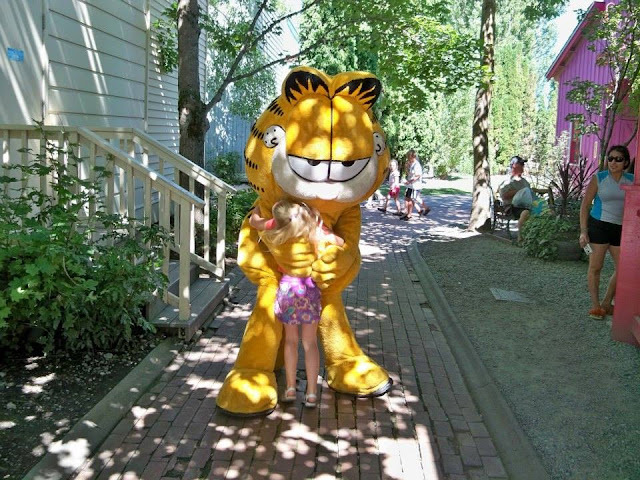 Even though my children weren't always fond of them (they can be quite intimidating for the little ones), Garfield and Odie are always happy to pose for photos, give hugs, hand shakes, and high 5's! 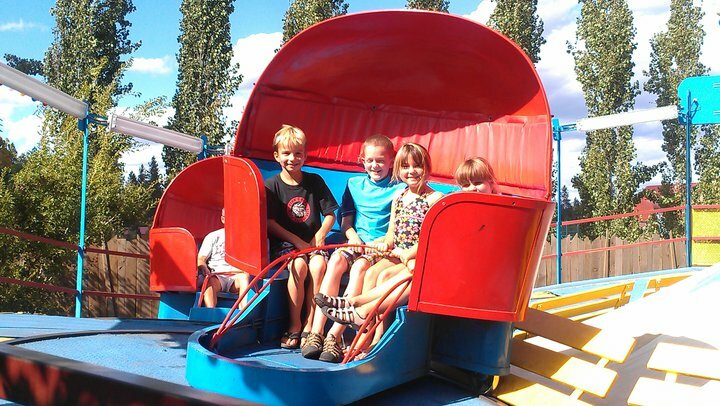 The amusement park includes rides and games for the entire family, young and old. 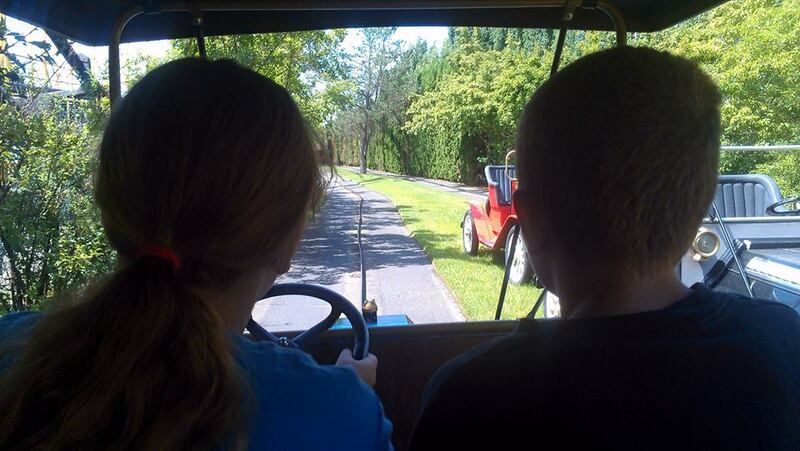 For those families with younger children, you can enjoy Garfield's Summer Camp! There is a Tiny Toot roller coaster, tree house, Red Baron airplanes, Kiddie Copters, Kiddie Wheel, Flying Elephants, and many more. For those older children and adults you can ride to your hearts desire. Coaster Alley may be exactly what the thrill seeker has been looking for, including Timer Terror, Aftershock, Tremors, Panic Plunge, Corkscrew and Spin Cycle! All of these rides are sure to get your heart pumping a little bit faster. 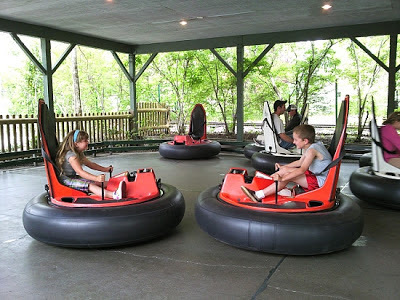 Other rides include the log flume, bumper cars, bumper boats, tilt-a-whirl, antique cars, Thunder Canyon, bumper boats, carousel and an all-time favorite, the ferris wheel! 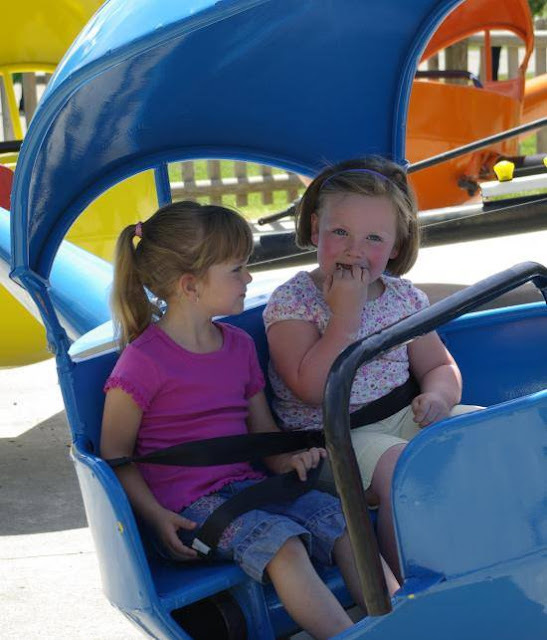 There are thrill rides, kids rides, fun for everyone rides, and a variety of family friendly attractions that are guaranteed to make for a fun-filled day for you and your family. 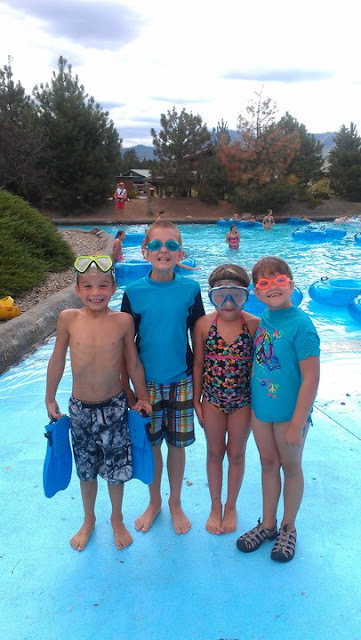 Boulder Beach Water Park is the perfect place to cool down on any hot summer day. We always start off by going down Avalanche Mounain and Ricochet Falls (the big family tube water slides), then it's off to the Elkhorn Creek lazy river before it fills up. 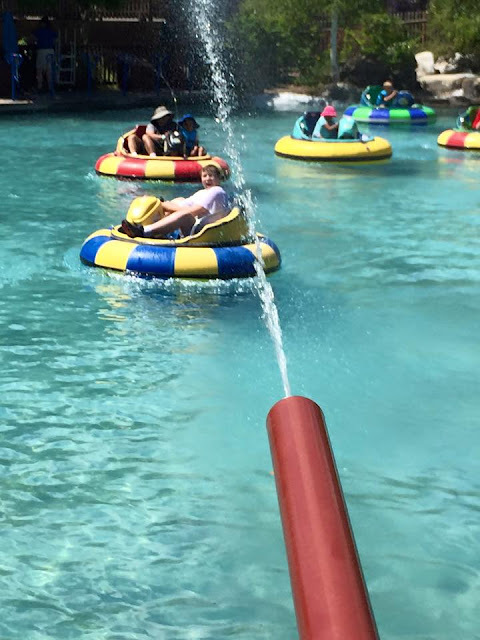 Then we hit the wave pool and Polliwog Park where there are slides, waterfalls, water squirters, and the sneaky Giant Bucket that dumps 500 gallons of water on your head! We have a plan of attack and it works great every time. The water park also offers a few slides for those risk takers. Velocity Peak will get your bathing suit in a bunch... this high speed water slide tower reaches up to 55 mph on a thin layer of water. Think you can handle it? If you want to slow down to a toddler's pace, they have a place for that too! Toddler Springs is full of fun geysers and fountains. I also appreciate that there are life jackets for all ages and sizes available for free use at all the water park attractions. That's one less thing to worry about! 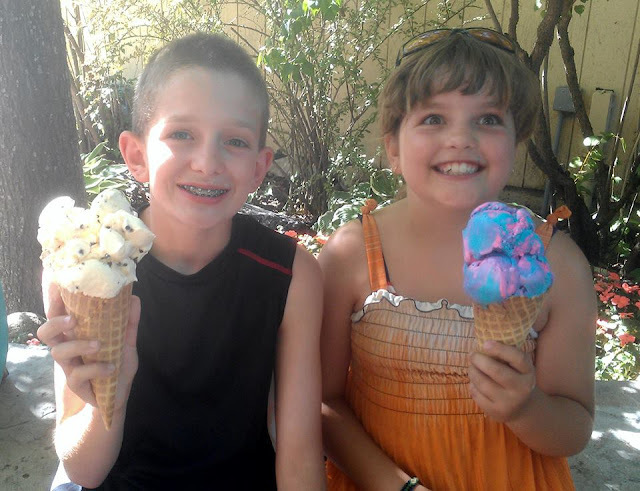 You can't forget about the variety of arcade games, food vendors, gift shops, and our personal favorite... the Ice Creamery ice cream shop! If you order a waffle cone here you may get a little more of a sweet treat than you realize... this is what a single scoop waffle cone looks like at Silverwood Theme Park!! 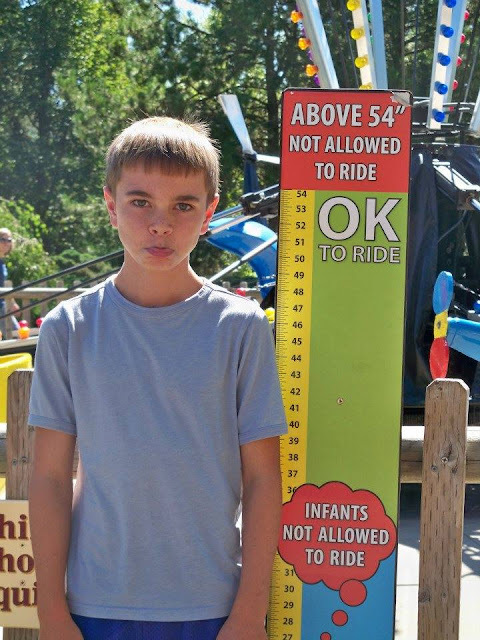 In addition to all the fun rides and attractions, there are other things I love about Silverwood Theme Park as well. The park is always clean, the staff is always friendly and helpful, and I love the music that is playing throughout the park, as well. There are also beautiful flowers throughout the park, grassy areas with shade perfect for taking a little break or snapping a great photo, and the variety of places to eat. 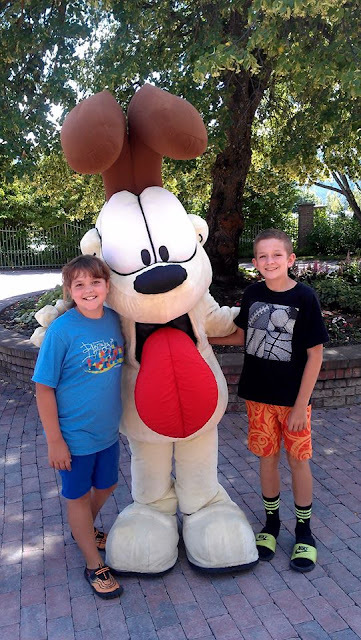 Looking back at all of the times we have gone to Silverwood Theme Park and all of the photos I have taken while we were there... we have had a lot of great times and made great family memories! Plus, we have made some pretty amazing memories with friends as well. Here is a great deal that I must share with you, as you are going to be thirsty all day, is to purchase the souvenir cups! I almost forgot about this until my friend reminded me. How could I forget? We have these and use them EVERY single time we go! The day you purchase the souvenir cups, you get free refills. Any visit after that, you can have them refilled with the drink of your choice for just $0.99! It's a great deal no matter how you look at it. Plus, we LOVE our cups and use them all the time! One of the cups we have is 14 years old, we bought it the summer our son was 1 1/2. Want to navigate the park easily? You can pick up a park map or download the Silverwood Theme Park app. That's right... there's an app for that too! For more information, discounts & promotions and ticket prices you can visit the Silverwood Theme Park website or check them out on Facebook. If you have never been to Silverwood Theme Park with your family before, I really hope that you get the opportunity to experience it. I will promise you that the entire family is going to have a blast! We began taking our son when he wasn't quite 1 1/2 years old, so I can assure you that there is something fun for everyone to enjoy.